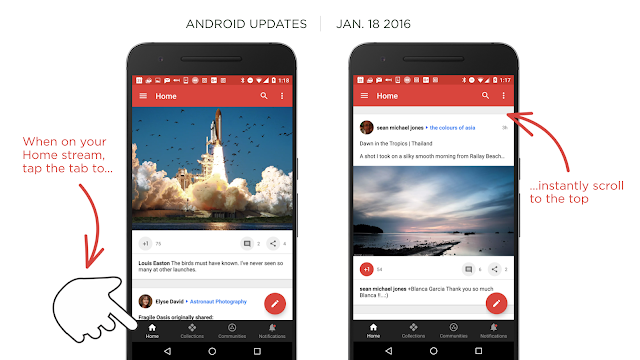 The Google+ team has pushed out a follow-up to this month’s major Android update. Earlier this month the Google+ app for Android hit a milestone with the release of version 7.0.0, which included a ton of much-awaited updates, not least being the hiding of the bottom black bar when scrolling through your stream. This was in addition to the home screen now remembering your position after returning from another screen, and the display of autocomplete suggestions when searching, among other changes. Last week, Google continued their relatively fast-pace of update releases with v7.1.0. Here, the most noticeable change is the ability to tap the Home icon to go right back to the top of your Home stream. This saves on scrolling endlessly or hitting refresh in the overflow menu. Pretty neat, don’t ya think? Besides this, the “Keep contacts up to date” setting was fixed, along with the solving of 17 accessibility issues and the squashing of 37 bugs. Though it was controversial to begin with (and still is), the bottom bar for me is becoming much less of an eye-sore since it’s finally out-of-sight when going through the posts in my stream. If you haven’t received this update yet, head over to APKMirror where you can sideload the app. As always, for those new to sideloading, you can follow our step-by-step tutorial here.